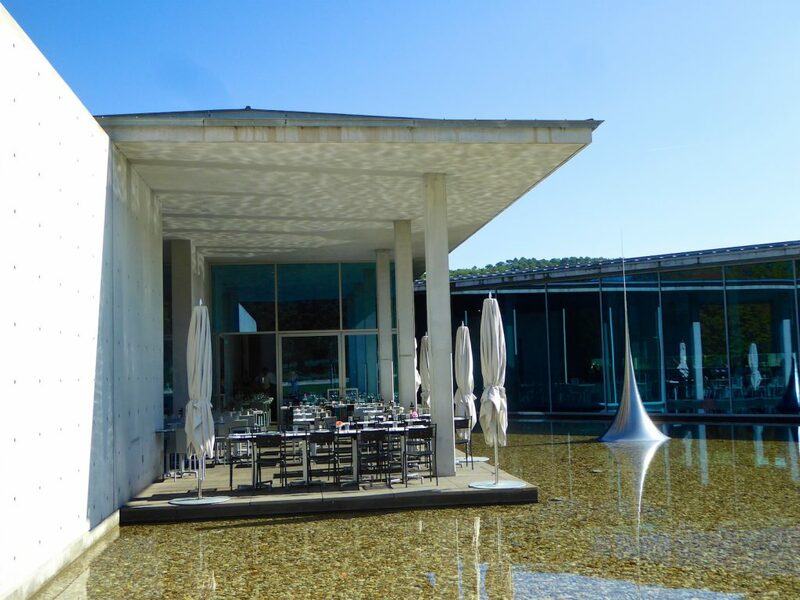 Nestled among rolling vineyards between the historic city of Aix-en-Provence (14km) and the stunning Luberon Valley (21km) you will find Château La Coste. Purchased by Irish real estate developer Paddy McKillen in 2002, the ordinary has been transformed into the extraordinary. Château La Coste is now a stunning domain set within 600 hectares, dedicated not just to fine wine but art, architecture and well-being. Come to enjoy the wine, stroll through the extensive grounds, admire the incredible art and be sure to leave time to eat at one of the estate’s scrumptious restaurants. Details below, reservations might be required. The Cuverie at Château La Coste, is a revelation bringing fresh life to a centuries old tradition skillfully merging the past with the present. 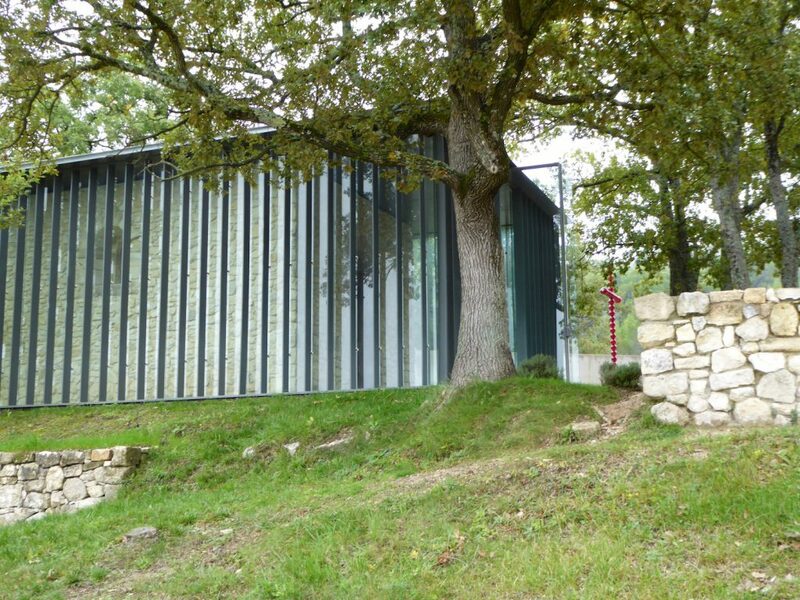 Using state of the art technology, this new generation winery, created by architect Jean Nouvel opened in 2008. 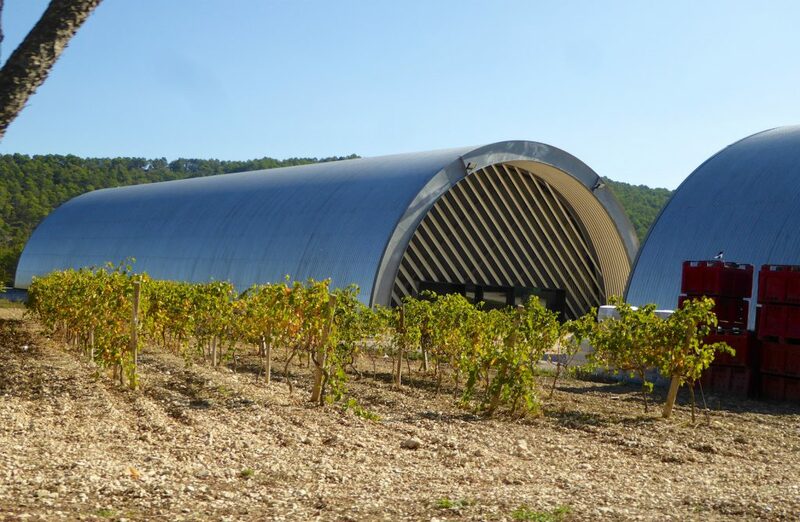 Over 10m high and extending 17m below ground it provides a perfect environment for preserving wine. Accessible only by guided tour: Daily in French from 11am and 3pm, 1pm in English. Fee 12€ – 10€. Committed to using biodynamic principles, Château La Coste blends Cabernet Sauvignon, Syrah, Grenache, Vermentino, Sauvignon Blanc, Chardonnay and Cinsault grapes. In 2008, just one year after their first harvest, they earned the prized organic ‘AB” distinction. 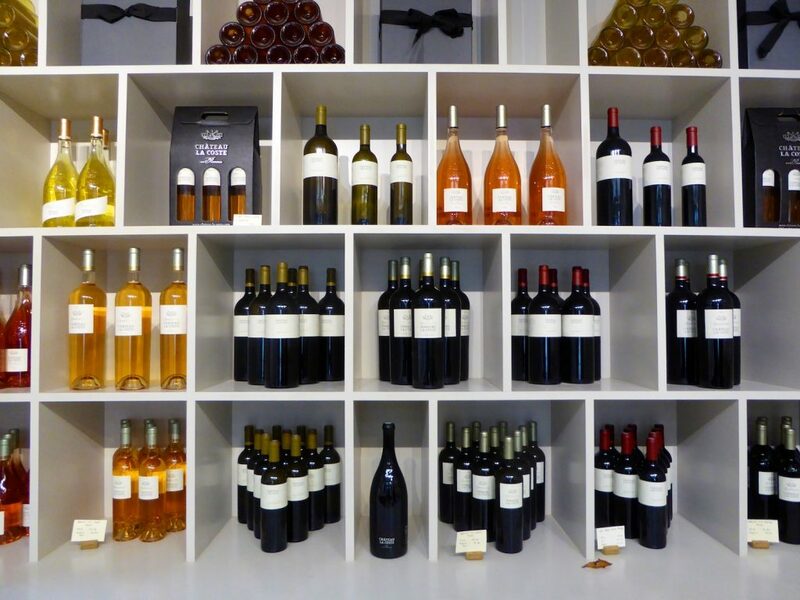 Sample for yourself, the wine shop opens every day at 10.00. 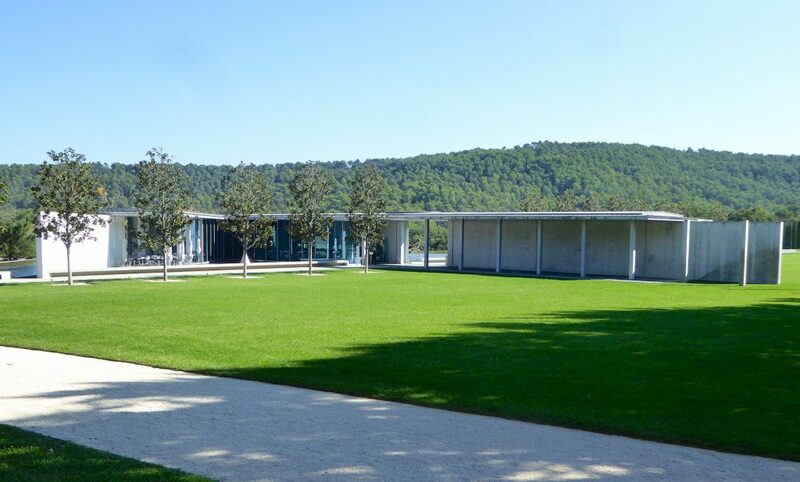 Designed by Tadao Ando, a self taught Japanese architect born in 1941, the Art Center at Château La Coste opened in 2011. Dramatic, somewhat austere concrete walls, dotted with small conical punches, lay at an angle to its V-shaped structure composed entirely of imposing bay windows. Sub divided into two, one area houses the reception area and book store, the other a cutting edge restaurant. Facing the vines it is set next to an infinity pool which cleverly conceals the underground parking below it. 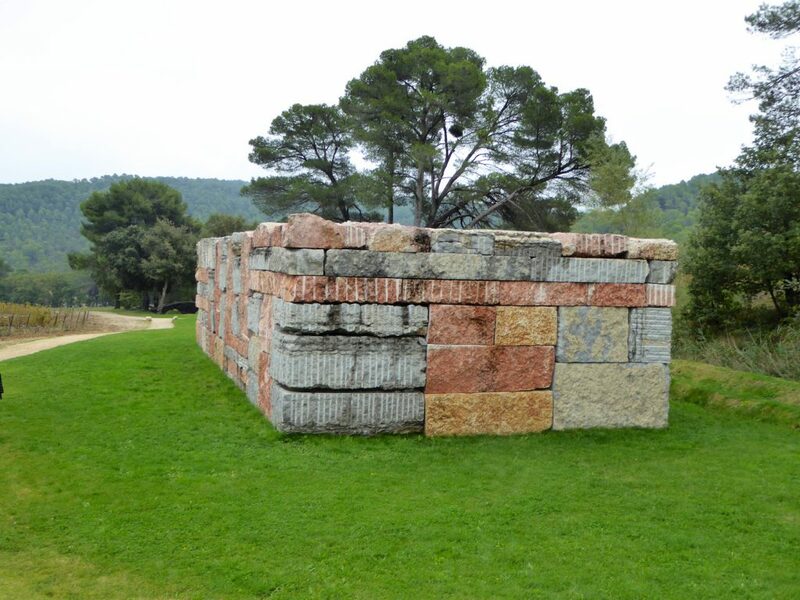 The Art and Architecture Walk at Château La Coste is a fascinating two hour stroll next to olive groves and rolling vineyards meandering through the woods beside some stunning pieces of art. Below are some of the 31 marvels which particularly caught my attention. 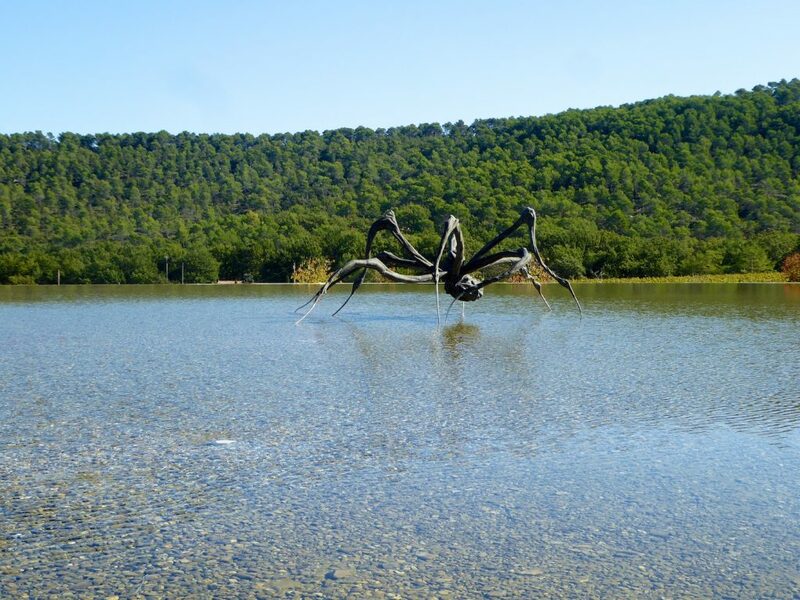 Taking pride of place next to the art center and hovering just above the glistening water is Louise Bourgeois’ bronze statue, created in 2003 and installed here in 2011. Believing spiders protect us, it was designed in homage to the artist’s mother, its twisted muscular legs reflecting the gnarled limbs of the vines surrounding it. 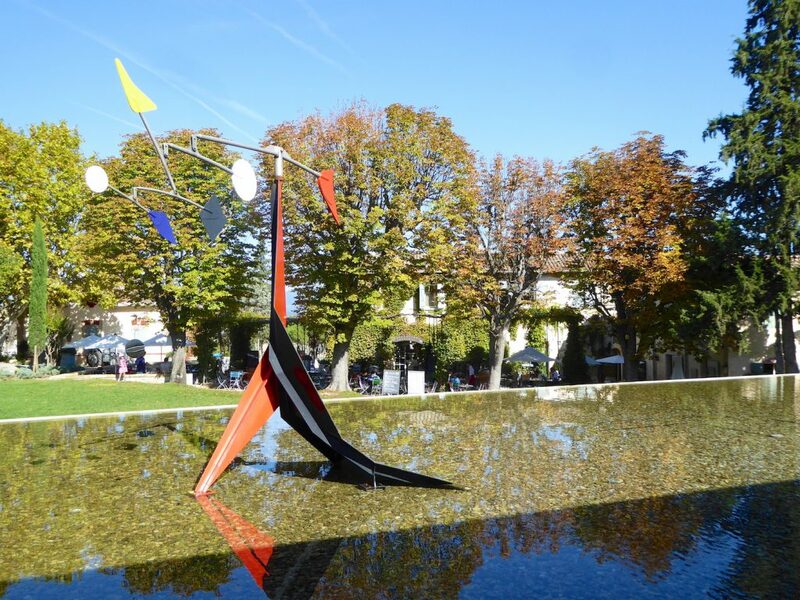 Created in 1976 by American artist Alexander Calder, famous for his interpretation of mobiles, this is the only piece not specifically made for the domain. 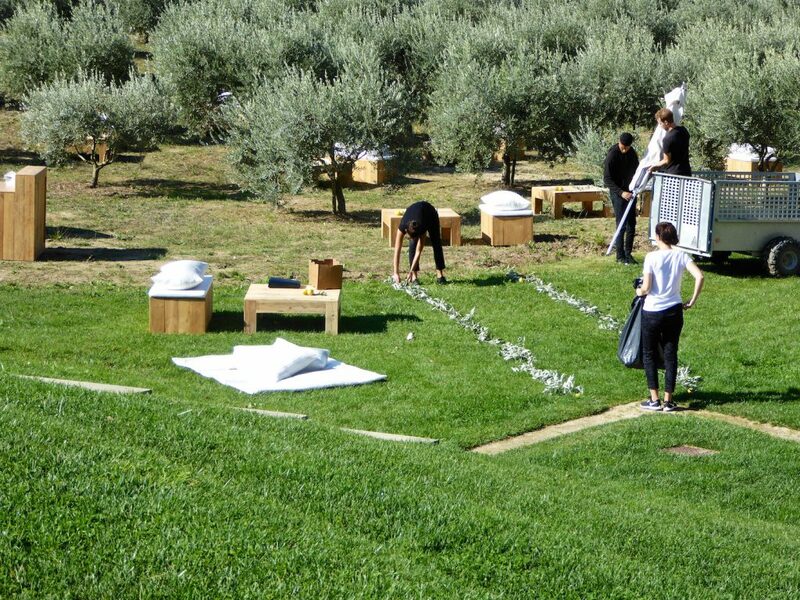 At its home at Château La Coste it becomes its most vibrant when swept up by the Mistral, a spectacle to witness! Best known for his paintings, Sean Scully’s Wall of Light consists of 1000 tonnes of limestone bought from Portugal. 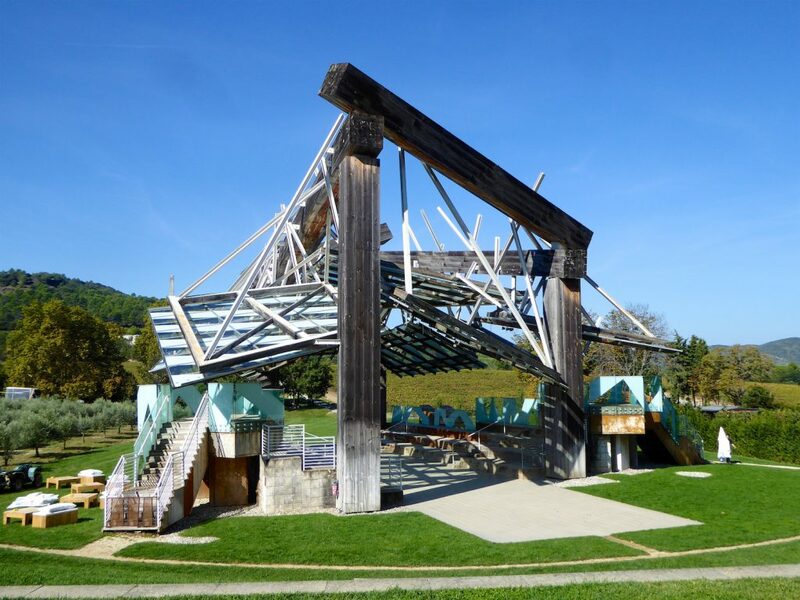 The pavilion was created as a partnership between world renowned Canadian-American Artist, Frank O. Gehry and the Serpentine Gallery in London where it was first exhibited in 2007. Gehry’s famous designs include The Guggenheim Museum in Bilbao and The Walt Disney Concert Hall in Los Angeles. 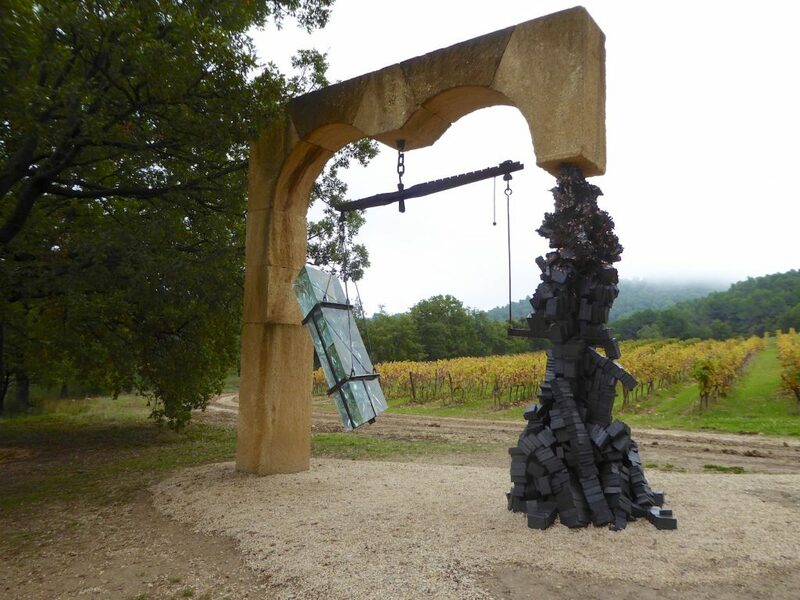 Combining cast iron magnets from China, quartz from Peru and local stone from nearby Rognes, this Brazilian artist’s work attempts to portray the link between the spirit and material. 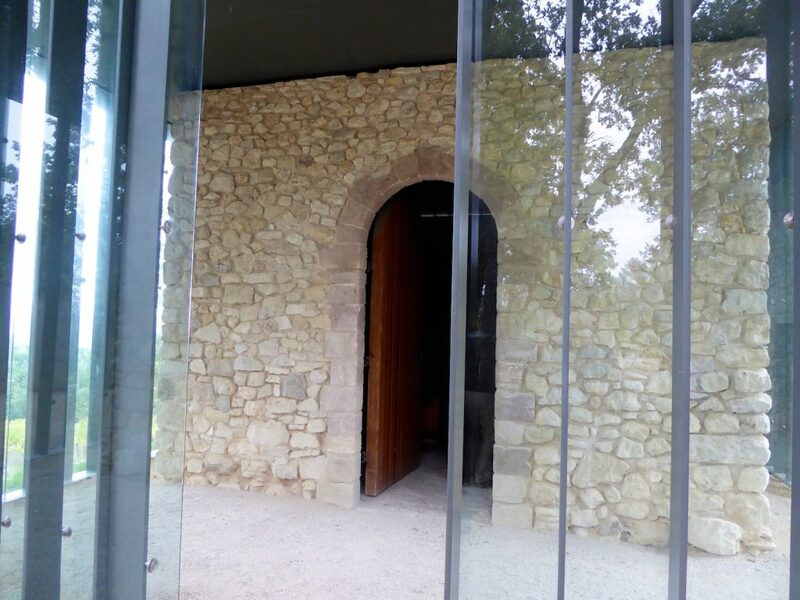 In Tado Ando’s restoration of this 16th century place of worship, the remains of the original structure have been wrapped in glass. It is situated at the pinnacle of the Art and Architecture Walk offering magnificent unobstructed views of the region. 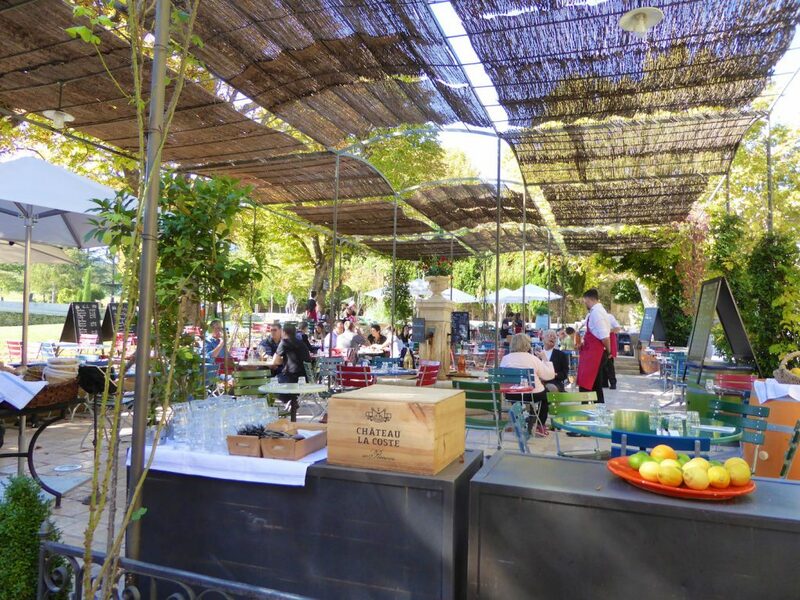 Set under shaded pergolas, where there is often live music, La Terrace is ideal for lunch, especially after a ramble exploring the grounds. 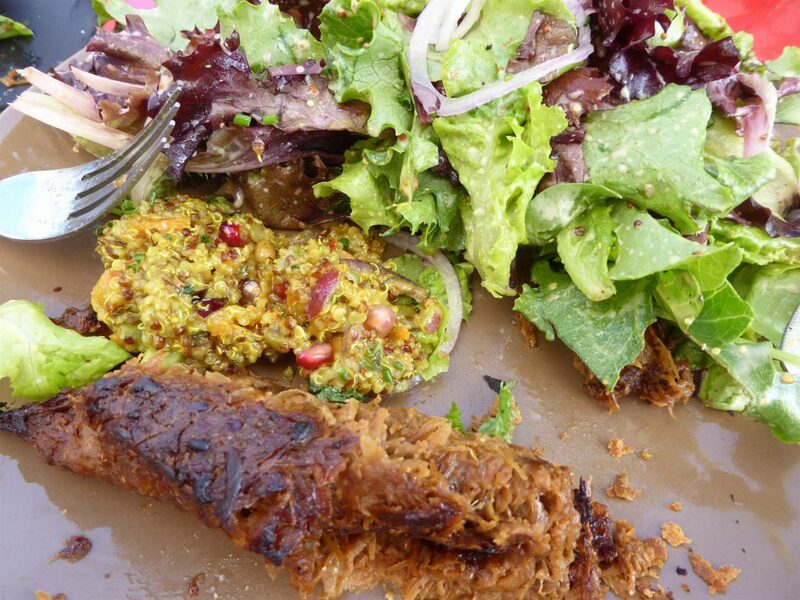 A casual bistro style menu of delicious salads, home-made soups and tarts. Approx. 16€ for a main course. More formal than La Terrace, this sleek, modern setting within the art center offers both indoor and outdoor dining for lunch and dinner. A la carte menu approx. 70€ for three courses, menu of the day 34€ per person. Describe as “bistronomic” (blending gastronomic and bistro), open daily for lunch and dinner; from 38€ for lunch and from 50€ for dinner. Situated on the hillside amongst the vines the hotel at Château La Coste, Villa La Coste, opened in 2017. A luxury haven offering twenty eight villa suites, ten with a private pool, and terraces boasting panoramic views of the Luberon. The contemporary architecture is accentuated by the use of local materials. It has beautiful, extensive gardens, a pool, bar, library and spa. Even if you don’t have time to rest your head at this sumptuous spot be sure to leave time to visit the estate should you be in this beautiful part of Provence. Click here to plan your visit. I’d love to know what you think and which pieces of art you especially loved! Lovely! 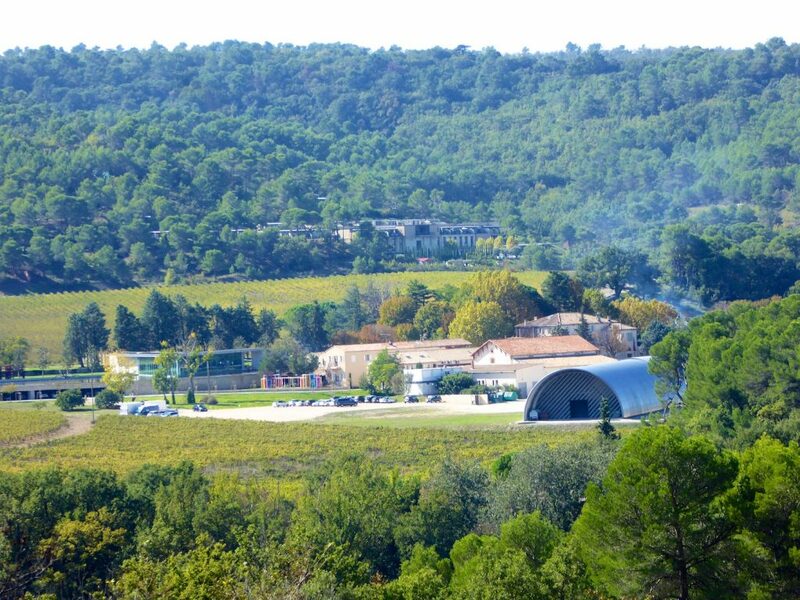 Definitely a place to check out on my next trip to Provence! 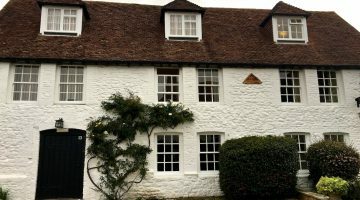 Hi Keith, it is definitely worth a visit! Happy Thanksgiving!